Scientists say that Hawaii's Kilauea volcano may soon become more destructive and spew rocks in the air. Meanwhile, Hawaii's tourism officials are pleading with visitors not to cancel plans to visit the islands. Scientists on the Big Island of Hawaii on Friday underscored their recent statements that the oozing magma, which has so far destroyed dozens of homes and forced thousands of people on the Big Island of Hawaii to evacuate, may not be as big a threat as the destructive lava flows that could soon hit the island. As a lava lake at Kilauea's summit drains inside the volcano, magma is running underground. It could burst to the surface as large, fast-moving and intensely hot lava flows. It could also produce higher levels of toxic gases, Hawaiian Volcano Observatory scientist-in-charge Tina Neal said. "What will take a turn for the worse in terms of hazard is if hotter, fresher magma makes it to the surface, and that could be what is coming," Neal said on a conference call. "Once a new batch of hotter, gassier magma makes it to the surface we might see larger, higher eruption rates." Read more: Why risk living on a volcano like Kilauea? Since the volcano erupted eight days ago, fifteen large fissures have opened on the eastern flank of Kilauea. The volcanic vents have oozed relatively cool, sluggish magma left over, according to scientists, from a similar event in 1955. Fresher magma could now emerge behind it. Kilauea, which is one of the world's most active volcanoes, also threatens to begin a series of explosive eruptions within days or weeks that could form huge clouds of volcanic smog, or vog, and hurl boulders as big as small cars. Geologists expect new lava outbreaks in or around the already hard-hit Leilani Estates area in the southeastern Puna district, which is about 20 miles (32 km) south of Hilo, where 27 homes have been destroyed and all 1,900 residents have been evacuated. Hawaii's Governor David Ige said Friday US President Donald Trump had approved his request for a presidential disaster declaration on the island. He said the declaration means federal assistance will be available as the state covers costs associated with damaged roads, public parks, schools and water pipes. Warnings that Hawaii's Kilauea volcano could erupt again are prompting people to rethink their vacation plans to visit the Big Island. Rachel Smigelski-Theiss is among those who have changed their plans. She had intended to visit Kilauea's summit with her husband and 5-year-old daughter and stay in Volcano, a town a few miles from the crater. Now those plans are off. She's worried potential flight disruptions would strand them on the island. "My equivalent of this — and I'm from South Florida where we have hurricanes — is driving quite literally into a hurricane," she said. Hawaii officials have been busy all month urging travelers to keep their plans, even as dramatic images of natural disasters afflicting the islands have been playing non-stop on televisions and social media feeds. George Szigeti the CEO of the Hawaii Tourism Authority, the agency that promotes Hawaii to the world, said Kilauea is being monitored around the clock in order to provide the public with the best information. Szigeti noted that the Big Island is "immense" and there are large parts of the island unaffected by the volcano. Ross Birch, the executive director of the Island of Hawaii Visitors Bureau, said he knows that officials "walk the fine line." "We know what people are going through in Leilani Estates. And we don't want to seem callous and inconsiderate in our messaging and our promotion of the island," he said. However, he also noted that tourism is the island's biggest industry and people's livelihoods are dependent on visitors coming. Why risk living on a volcano like Kilauea? Lava from the erupting Kilauea volcano on Hawaii's Big Island has now blocked a highway and entered the ocean, officials said. A man was also seriously injured after his leg was struck by lava. 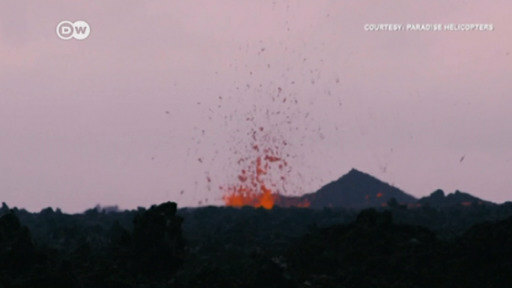 New volcanic fissures have opened up on Hawaii's Big Island, with the number of homes destroyed by lava jumping to 26. Some residents have briefly returned home to rescue pets and valuables. The erupting Kilauea volcano on Hawaii Island briefly released a huge ash cloud. Recent activity has sent lava flowing into neighborhoods. Authorities have closed schools and issued warnings about toxic gas - but some residents refuse to evacuate.